This design for the basement floor shows that it contains warehouses and a kitchen. The semicircular warehouse at the rear of the building provides access to the two small courts behind, one of which contains an external water closet. 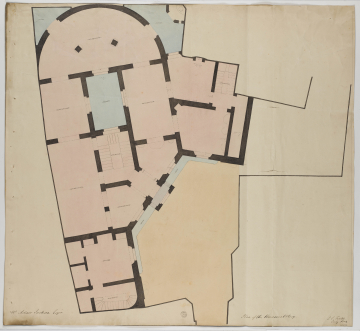 The function of the two rooms to the right of the warehouses on the drawing is unspecified. The long narrow room to the right is a coal cellar.